Toss potatoes in a small amount of olive oil in a shallow roasting pan. Salt and pepper and roast at 350 degrees F. for 25 to 30 minutes. Grill the zucchini cut side down about 4 to 5 minutes. Place red bell peppers directly over gas burner for 3 to 4 minutes, turn until all sides are charred. Cut into 1- to 2- inch size pieces. 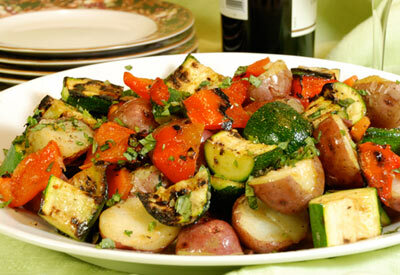 Drizzle and toss all the vegetables with 1/4 cup of olive oil and sprinkle with salt, pepper and basil. Arrange the vegetables on a platter. *The key to getting those great grill marks is to not shift the vegetables too frequently once they've been placed on the hot grill.